Created to showcase the range of dynamic contemporary photography coming from Korean and Southeast Asian artists, “Emerging Wave“, currently on view at the GoEun Museum of Photography in Busan (South Korea), features works from 27 artists ranging from emerging creators to established veterans. Established in March 2009, the ASEAN-Korea Centre promotes both cultural and economic cooperation between Korea and the ten ASEAN (Association of South East Asian Nations) member countries. The organisation recently partnered with Seoul Art Centre’s Hangaram Art Museum to open their 2010 photo exhibition which features 27 artists from 11 countries. The exhibition, which is the second since ASEAN-Korea Centre’s launch, exposes the international community to new work by some of Southeast Asia’s brightest contemporary photographers. 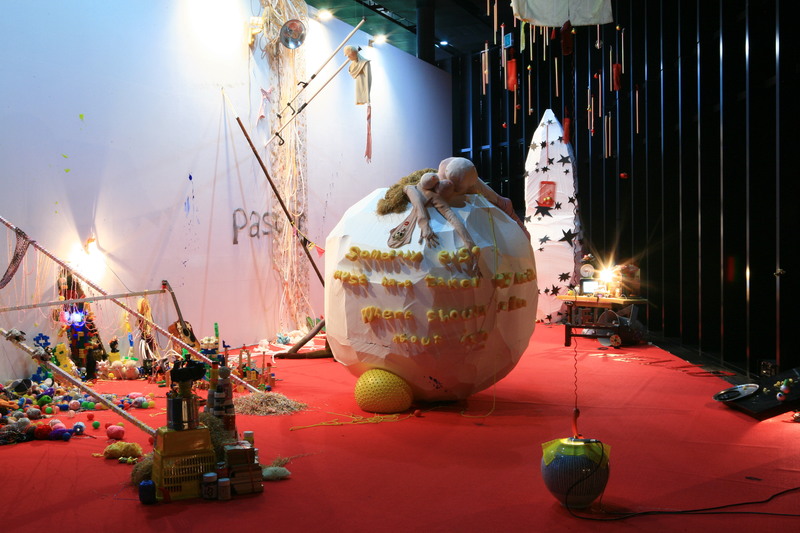 While many of the participants are veterans, the exhibition gives younger artists exposure to the contemporary art scene of a major city such as Seoul. For example, for emerging Bruneian photographers Hirfian Hussain and Akmal Benangsutera, the exhibition is an opportunity to showcase the budding photography scene in their home country, as well as a chance to connect with dedicated artists from outside of Brunei. Po Po, 'Searching for Identity: Bottle # 1', 2002-2007, C-print, 167 x 305 cm. “How can I make cubist photos which present every aspect of a thing? These works are not objects of material. They are objects of mind”. Although in an article on the Myanmar Times website Po Po states his distinterest in “flashy technology or visual hype”, his selected photos demonstrate his willingness to experiment with newer media to create complex, visually stimulating images without losing the sincerity of his message. Like Po Po, Singaporean artist Mintio incorporates multiple overlapping angles in photos from her “Concrete Euphoria” series (2008-2009). Mintio, 'Kuala Lumpur City Centre', 2008, D-print, 152 x 122 cm. In spite of being relatively young Mintio, who got her start at a major commercial studio at age 16, has already created a stir with her documentation of Asia’s largest cities using long-exposure techniques. For Mintio, the process is about both rediscovery and finding the unknown in familiar things. Also on display is work by fellow Singaporean Zhao Renhui, a resident artist and member of the Institute of Critical Zoologists. Zhao channels his fascination with man’s perception of animals into photos sometimes depicting live or taxidermy creatures, and other times depicting man’s often futile attempts to be at one with nature. In an interview with Asian Photography Blog, Zhao expresses the idea that photography is a medium through which people “relate to animals and the world”. At the same time it is a medium which “blurs the distinction between fact and fiction”. In one particular image he presents a zoologist who appears nearly invisible with the aid of a camoflague cloak and photo manipulation. Zhao Renhui, 'Tottori Sand Dunes', 2009, archieval piezographic print, 84 x 121 cm. In doing so, Zhao presents a surreal image as reality and challenges the validity of photography as a medium for depiciting truth. For the artist, reality in photography is illusory and constantly in flux. Viewers must try to make sense of the natural, scientic world through a manipulated, and possibly false, image. “Visitors are presented with contrived, idealized images of Thainess by Thais ourselves … countless published views of Thailand are staged and styled. The contrivance and the reality rarely match, leading to startling juxtapositions”. In presenting what he calls the “unexpected moments”, Dow aims to show unabashed ‘Thainess’ with humor and unself-consciousness. Indonesian photographer Angki Purbandono makes use of what he calls a “freestyle” approach which allows him to employ methods ranging from collage to the scannography technique used in “Avocado Horse” (2010). Even so, Purbandono doesn’t separate himself from other photographers too much. Angki Purbandono, 'Avocado Horse', 2010, scannography, 100 x 100 cm. Although most of the eleven countries are represented by two artists, organisers made sure to give Korean artists plenty of additional exposure. Bright candied flora populate the work of Koo Seong Youn while Hyun Mi Yoo seems to suspend falling objects in time with skillful compositions. The warped perspectives of Zu Do Yang, Wawi Navarroza’s impersonation of Mexican artist Frida Kahlo, and “real vs. unreal” themes explored by artist Lee Yeleen add to the diversity of subject matter and style. Given that they were chosen for their talent and thoughtful innovation, it comes as no surprise that “Emerging Wave” participants turn the idea of photography on its head. With their photos they call on viewers to question the factual nature not just of the images they view but also the experiences which they have come to accept as normal and routine. Koo Seong Youn, 'Ht01 (+ Ht02), C-Prints, 2009, 120 x 150 cm. Other artists included in the show are Koreans Choi Jung Won, Lee Won Chul, and Nanda; Laotians Manichanh Pansivongsay and Phonephet Sitthivong; Indonesian artist Arya Pandjalu; Filipina artist Bea Camacho; Malaysian artists Liew Kung Yu and Tan Nan See; Burmese artist Thit Lwin Soe; Tanapol Kaewpring; Vietnamese artist Le Kinh Tai; and Cambodians Sok Sophal and Tralong Borin. The exhibition has moved from the Hangaram Art Museum to the GoEun Museum of Photography in Busan and will close on 8 August.